Our journey today is Sarah from Small Things NYC. A post-partum doula, babywearing expert, infant massage instructor and the newest member of the Caribou Baby sales staff. 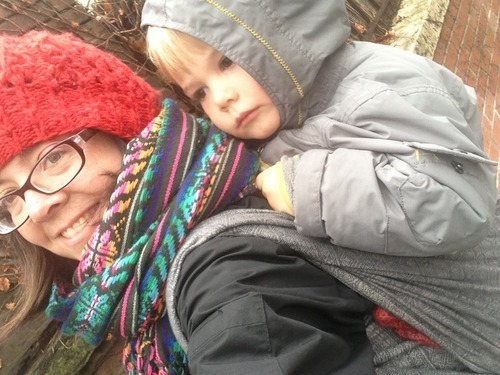 I found Sarah while researching babywearing during winter and her wealth of knowledge and expertise is immense. Stop by Caribou and say hi. When did you first become a mother? Somewhere between August 2008 when iIgot pregnant and April 2009 when my son was born. My husband clearly became a father when my son was born and I clearly had become a mother sometime before that, I’m not quite sure when it happened though. But I didn’t really get the true depth of motherhood until I first held my son in my arms. I was blown away in that moment by the power, strength, and sacrifice of motherhood and I had only tasted the tip of the iceberg. Was the reality close to your personal image/idea? Not at all. I’m not sure what I envisioned when I look back at it. I didn’t realize how much of my personal self motherhood would take. I think I thought my life would be the same and I would be the same, only with a child to tote around and less sleep. I had no idea that I was turning over almost all control over my existence to a small helpless creature. Or that I would both love and hate that process as much as I did. When I had my second child I was truly shocked at how easy newborns are to take care of. I realized then that what had felt so hard about becoming a mother was not so much caring for a new baby—they are pretty predictable beings, at least when compared with a toddler. What was difficult was really this process of becoming a mother and accepting that my life was no longer quite my own. That I didn’t get to choose when I slept or ate or showered. That everything could suddenly become chaotic in a matter of seconds. That it suddenly was soooo hard and took sooo long to get out the door (or do anything normal really). By the time I had had my second I had long given up the illusion of control and was much better about going with the flow of how things actually were rather than how I wanted them to be. So little about having kids is how you want it to be. And so much of it is a million times better than you thought it would be. Before becoming a mother what did you know about motherhood? I knew that mothers loved their kids but I really never truly understood the depth of that. I read somewhere that having children is like putting your heart out into the world to walk around without you being able to fully protect and control it. Scary and powerful stuff. How would you describe the first year? It was so many different things it is hard to describe it any one way. Exhilarating to watch this person grow and emerge. Sheerly and utterly exhausting—my son didn’t sleep more than 3 hour stretches until he was 14 months old. Extraordinarily painful—I herniated a disc when he was 6 weeks old and struggled with a great deal of pain until I had back surgery for it a year later. Quiet—it’s funny to spend so much time with another person and yet still also be alone most of the time because that person isn’t quite a person yet. Sometimes I long for that quiet to return to our house with a chatty 3 year old! Fascinating—I always say I should be able to write off parenting as a professional expense, I learn so much about child development and education just sitting back and watching. Humbling—I learned a lot about letting go. I’m a perfectionist and a control freak about things I set my mind to and it was hard for me to not have everything be perfect. I would make up a plan for how I would like things to go and them my son would have other ideas. I would spend a bunch of time trying to convince him my ideas were the way to go. It was painful. Finally I learned that most of my plans were pretty silly. If the kid is getting enough sleep why obsess over an early bedtime because the books say that’s how it should be? We we all much happier when we just let things be. My son always wanted to conk out at 11 and sleep in till 11. Honestly, that was my preferred sleep pattern too. So why was I trying so hard to change it? I started ignoring advice books and just doing what worked for us, only changing things when we were actually being driven crazy by a real problem rather than a perceived one. What helped you to get through it? Well, I didn’t really have a choice! Sometimes you just have to keep on plodding forward. I often thought about how hard parenting is and yet how totally normal it is. Women have been raising children forever. If they have managed for centuries then I could get through it too. But most of the time I tried to just find the sheer joy in each really hard moment. I remember one point when my son had been waking up to have what I like to call “dance parties” around 1am and staying awake for about 2 hours. It continued for about a month and there didn’t seem to be any way to change it. During one of them I watched my son discover shadows as only one can do in a room lit by a bedside lamp. We had an hour of family shadow puppetry that I will always remember. I really don’t remember the tired, hard, painful feelings anymore. But I do remember the smiles, the discovery, the cuddles, and the joy. During my daughter’s first year I tried to remember that in hard moments. Like when she wanted to nurse for four hours straight every night I tried to just think the whole time about how nice it was to hold a small baby for so long instead of thinking of all the things I might rather be doing. I knew I would have years to do all those other things but only a short short time to hold my daughter while she was small. Did you have a support system near by? No. Our family lives far away. Though I did have more of a support system than I realized, took advantage of, or sought out. I’m bad at asking for help and taking care of myself, and I should have done that a lot more. I spent a lot of time thinking I needed to do things a certain way because my baby needed it and it was not healthy to ignore myself in this way. My back was aching for a while during that first month but I insisted on wearing him constantly and doing this vigorous twisting rocking motion to get him to sleep because it was the only thing that worked. But ignoring my body’s messages and not taking my own needs seriously is what led to my injury. I should have taken breaks. i should have found a different soothing strategy. Afterwards I had a lot of excuses for not dealing with it that seemed very real at the time—too difficult to get to a doctor, couldn’t leave the baby, couldn’t afford a babysitter, etc. In retrospect they were crazy and I should have sought out more help. I should have paid for more help—chiropractors, acupuncture, babysitters, mother’s helpers. I’m sure there were things that we bought we could have gone without. The support we could have had would have been far more valuable. We really love your blog, Small Things NYC. Can you share a bit about how it came about? I started it when I began my website for postpartum doula work and it sat there for a long time gathering dust. One of my mom friends told me she liked talking to me about kids a lot but wished she had more time to do it. ”Write me some blog posts so I can hear your ideas more,” she said. And so I did. I decided to just start writing down all the various things I think about as I go about staying home with my two kids. So some of it is from a practical perspective of things we do to stay occupied. Some of it is from my musings as a postpartum doula and obsessive babywearer (and babywearing instructor). And then a lot of it is from my early childhood educator gears whirling as I watch my kids grow and develop. I’m always learning and thinking about new things as I watch them and also as I talk to parents who don’t have a teaching background. Parenting is really one of the most important jobs we ever have and most people come to it with absolutely no preparation. I wouldn’t say I’m prepared for it by any means but I do have a theoretical and practical background to fall back on. As I move through conversations with other parents I realize how helpful a little information on how kids learn and develop really can be. Everything from staying sane, disciplining effectively in the heat of the moment, to choosing toys for your kids. Parents are the most influential people in children’s lives and our culture has built parenting up into this act of sheer terror. It feels like at any moment you could take a misstep and ruin your kids forever. I want to take that terror down a notch with real information. For the most part we all need to relax. But it is hard when you really aren’t sure what you are doing and you want to be perfect! We also know you’re a post-partum doula, can you share how you came about that profession & what you love about it? After I had my son I spent a lot of time informally doing postpartum doula stuff for friends or on various online groups. I decided teaching was going to be unsustainable with a toddler and new baby in the house and wanted something with more flexible hours. Actually, when I was pregnant with my first I remember saying to my husband “you know I’m going to end up having to become a doula or something” jokingly. But then when I was pregnant the second time it became a real thing. A lot of my work as an early childhood teacher was supporting parents and I see my postpartum doula work as an extension of that. I want parents to really find their strength and confidence! Learning to read your baby and trusting your instincts are really key to this, but it is so hard in a culture where new parents are bombarded by an incredible amount of conflicting information. Particularly when many people become parents with very little experience being around children at all! I love watching parents blossom. Tips for new moms? Relax. You won’t break your baby. You are the perfect parent for this little creature. Do what feels right to you and what works for your family and change it when it stops feeling right and working. Other people’s families are different and their babies are different and no one else has ever parented this unique human but you. You can listen to the advice that everyone gives or not as you see fit. Don’t put so much importance on every tiny thing you do. Your child has a long life ahead of them and you will make many parenting decisions that will thrill you, and some that will not. But there is very little you can do with a baby that cannot be undone. They do have a need for closeness and warmth and food but beyond that relax. Your baby will change so many times in the first three years that you will look back and this teeny person will be almost unrecognizable to you. If something works wonderfully now, it will change. If something is incredibly hard now, it will also change. Some things will always be hard and some things will always be beautiful. Focus on the beautiful as much as you can. And snuggle that baby a lot, because they really do grow up so fast. But also, absolutely and unapologetic take some time for yourself—it is hard work to work 24 hours a day!